It is with great sadness that we announce the sudden passing of our beloved husband, father, grandfather and brother, Steve (Butch) Escott, on August 10, 2017. Predeceased by his parents Bill and Joan Escott and his nephew Matthew Sharpe. Left with fond and loving memories his wife and best friend Elaine O’Brien, daughter Natasha Brocklehurst (Keith), step daughter Jessica Wadden (Mike), two precious grandsons whom he loved dearly, Mason and Brandon Wadden; sisters Joanne Escott, Rosalind Escott (Rick), and Rosemarie Hickman (Cec); brother Bill Escott (Nina); mother and father-in-law Bern and Junior O’Brien; brothers-in-law Earl O’Brien (Annette) and Erwin O’Brien (Tammy); and sister-in-law Wendy Duggan (Brian). Steve also leaves behind a large circle of aunts and uncles, nieces, nephews and cousins. He will be especially missed by nieces Lisa Sharpe and Morgan Escott. Steve will also be missed by his many friends in Deer Park and the Construction Industry. Resting at Carnell’s Funeral Home, 329 Freshwater Road, on Saturday, August 12th from 6 – 9 p.m. and Sunday, August 13th from 2 – 4 and 7 – 9 p.m. Cremation will follow. Funeral service will be held at the Carnell Memorial Chapel on Monday, August 14, 2017 at 2 p.m. with interment to follow in Holy Sepulchre Cemetery. In lieu of flowers, donations may be made to the Diabetes Association in Steve’s memory. Hi Elaine, we are so so sorry to hear of this fatal accident . Our hearts are broken. If you need anything please call us 749 1997 or 867 222 1211 . We will be back to our cabin aug 15 . I knew Butch and his family from Ridge Road. Elaine (and Family) , I am so very sorry to hear of Steve’s passing. Unfortunately, I never had the opportunity to meet Steve. I was home the first week of August and everyone was headed over to your cottage on Sunday for a BBQ. My thoughts and prayers are with you at this sad time. R.I.P. Steve. I am so sorry for your loss Elaine. My thoughts and prayers are with you and your family during this difficult time. Sorry to hear of Steves passing sincere condolences to all the family …..great friend left us too soon may his gentle soul fly high with the Angels in heaven . May God give you the strength during these difficult times !! I’m so sorry to hear about Butch…thinking of you and your family. Elaine, I’m so very sorry to hear about Butch. You always spoke so warmly and lovingly about him. He sounded like a wonderful person who brough so much to your life and everyone’s around him. I’m sure he’ll be remembered in that light. My heart and thoughts are with you. Take care. My condolences to Elaine and all the Escott and O’ Brien families. So sorry Elaine, Jessica and families, to hear about your loss. Thinking about you . Elaine, I was shocked and saddened when I heard the horrible news. I am so deeply sorry for your loss. 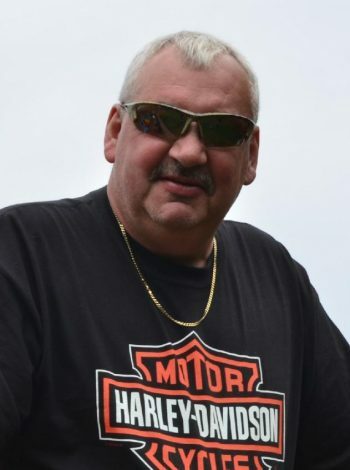 Butch was a great guy who had a large Harley family who will miss him dearly. Rest in peace brother. Elaine, I was so shocked and saddened to learn of your husband’s sudden passing. My most heartfelt condolences to you and your family. Elaine, words could never express how deeply saddened we are for the loss of Steve. Just two years ago we met in Hender’s Road while ye were looking for a moose….that’s when a great friendship was made. Steve and Shawn got along like they were friends for a lifetime…many a time spent having a coffee and a yarn in the ” smoke room ” at your house in Deer Park. There was never a time when you’d show up and Steve would ask you “want something to eat? or have a coffee ” we always felt so welcome. He thought alot about you and it showed…a great man who cared deeply for his grandkids as well. No one can heal your pain but time, family, friend’s and great memories will make each day help you through.Deer Park has lost a great friend, RIP my friend. So sorry Elaine. There are no words. Thinking of you. Keep his memory alive. Shocked and saddened to hear of Butch’s untimely and tragic death! Please accept our sincere sympathy and may precious memories of your loved one help to lessen the terrible loss and grief you share at this time. So sorry for your loss Elaine. Your in our thoughts and prayers at this difficult time. Condolence to all the family . Our heartfelt condolences to the Escott family at this most difficult time. Our most sincere and heartfelt condolences to The Escott Family. As I mentioned to Elaine shortly after hearing this devastating news, Steve was The Older Brother that I did not have but wish I did. We often shared ideas and laughter as well as a few tears during some of our challenges. We helped each other in a heartbeat and solidified an agreement with nothing more than a handshake. Although our friendship spanned most of the last decade, we always remained in communication. I trust that Steve is in Heaven riding his Harley, still steering us away from harm and guiding us the best he can. Our deepest condolences to you and your family during this difficult time. Elaine & family – we were shocked to hear about Butch, although we didn’t know you both well it’s always sad to hear such terrible news. He was doing what he loved, riding his motorcycle & now he’ll continue to ride those bright highways in the sky until you meet again. Our thoughts & prayers are with you at this very difficult time., RIP Butch. Both Gerry and I are so sadened by the loss of Steve. What a super …easy going guy he was. You were a model couple without a doubt. So sad…….Big hug to you and family. Elaine, my deepest sympathy in the sudden loss of Butch. Hold on to the memories you’ve shared, and may the love and support of those around you help ease your pain. My thoughts and prayers are with you. My sympathies to the Escott family. I knew Butch from our days at St. Pius X Boys School in the 70s. I will remember him as a happy, gentle giant who was always kind to the younger kids like me. Please know that he is well respected and remembered by many. God bless Butch! So Sorry for your Loss..Sincere Condolences to you and Your Family.. So sorry for your loss! Our love, thoughts and prayers are with you and your family. May we meet again , RIP Butch . So sorry to hear of steve’s passing my thoughts and prayers are with you all at this time,he was a great man and a hard working man, may god bless you all. Thoughts & prayers to all the family , RIP Butch . Thoughts & prayers are with Elaine and all the family at this very sad time, we send our condolences to you all. I am so terribly for the family. He was a good friend to a lot of people. I am still in chick so young. It will hit me hard at the wake – seeing everyone again under such sad circumstances. My heart is broken over my dear childhood friend Butch. May you Rest in Peace dear friend. To all of the family my deepest condolences to you all. God Bless! by John & Wendy Coady Walsh. so very sorry to hear of your husband’s sudden passing. Your in my thoughts and prayers. My thoughts and prayers are with you as you mourn the passing of Steve. So sorry to hear of the passing of your loved one, Butch. You are in our thoughts and prayers during this sad time. We send our deepest condolences to all of his family. Rest In Peace, Butch. so sorry for your loss of butch,our prayers are with you all. Elaine, myself and Brian are shocked and saddened to hear of Butch’s sudden passing. We have such fond memories of living next door on Ridge Road. Our deepest condolences. Elaine and family, so sorry to hear of the tragic passing of Steve. Prayers going to all of you for strength through this difficult time. Deepest condolences to the families. My Thoughts and Prayers go out to You all today on the lost of a Great Father, Husband, Brother and Uncle and Friend to many. I wish there was something I could say or do to ease your pain Especially To his wife Elaine and Sister Joanne. Please know I am here for you if you need anything. God Bless You all.